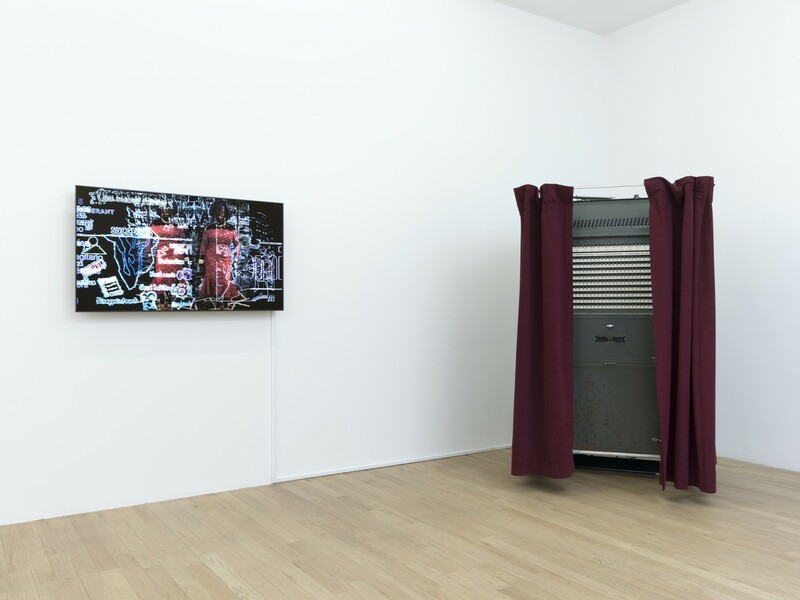 Artist and composer R. Luke DuBois’ solo exhibition The Choice Is Yours at bitforms gallery historicizes and repurposes voting technologies from the mid-twentieth century. This was a time soon after General Electric coined the term automation; when technological efficiency still translated to a complex arrangement of metal gears, themselves being increasingly hidden to emphasize the simplicity of a lever. 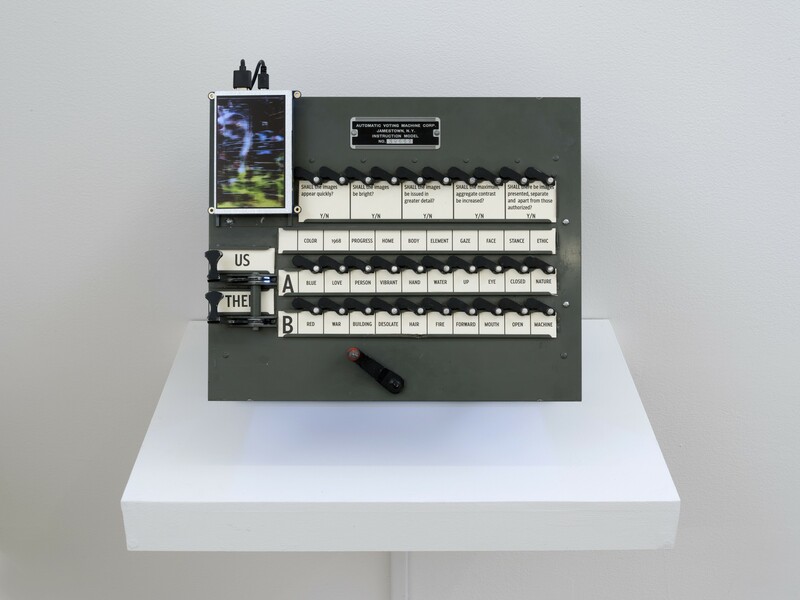 Such levers feature prominently in the gallery, where five Automatic Voting Machines (AVMs) have been installed and modified to incorporate present-day programming technologies. Direct references to American state politics can be seen on small paper cards which list the names of John F. Kennedy and Richard M. Nixon, among others. These cards are displayed in a long glass case alongside various tools, manuals, metal contraptions, and keys to the voting machines. 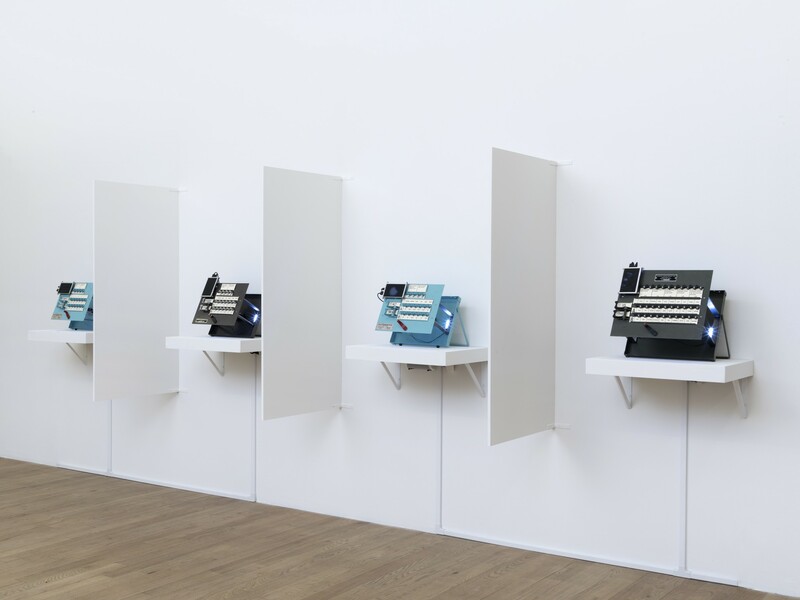 For this display, titled Voting machine ephemera, 1946-2000, DuBois has laid out the bones of machine automation, knolling them as if for a history museum’s permanent collection. 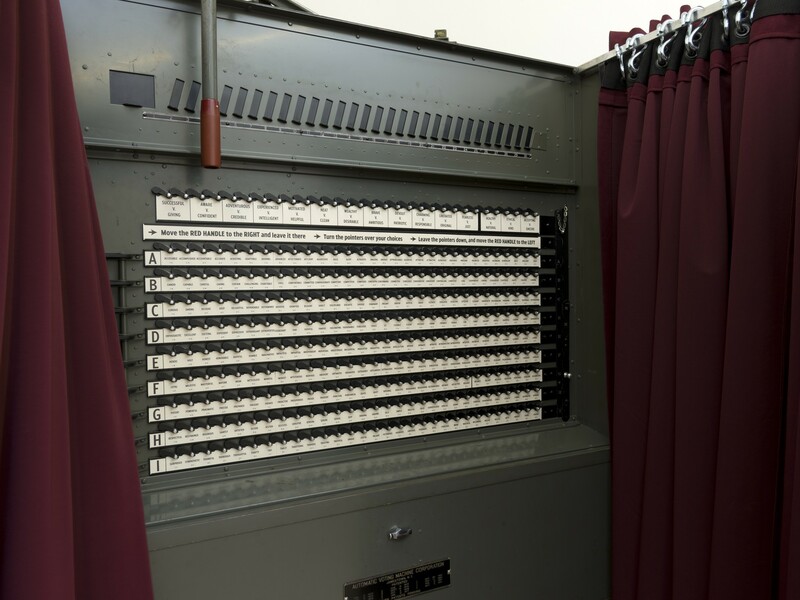 Nearby, the color film Behind the Freedom Curtain sponsored by the Automatic Voting Machine Corporation and produced in 1957, expresses nostalgically outdated technological enthusiasm for the AVMs. The film’s narrator describes the “ease, speed, and economy” of a machine that was called upon to “[compete] hard for the citizens’ increasingly valuable time…as industry moves to automation.” A text titled “A Short History of Voting,” written by NYU Professor Jonathan Soffer contextualizes the technological history of voting machines with a timeline of suffrage reform in the United States. In Learning Machine #2: Image (2016), Learning Machine #3: Sound (2016), Learning Machine #4: Language (2016), and Learning Machine #5: Symbols (2016), participants are asked to vote on a number of aesthetic parameters to be realized in a short video. Candidates and questions regarding policies have been replaced with options such as “X-F+F[FA]+[Y]” and questions like, “SHALL the colors be bright?” After voting, a large red lever is turned, programming the voter’s choice of sound, text, or video parameters into a unique video composition. Like the film, the learning machines aestheticize the tools of democracy—this time in favor of nostalgia rather than techno-fetishism. DuBois has both repurposed outdated hardware and depoliticized the voting process in service of creative coding. One might therefore surmise that The Choice Is Yours has little to do with politics. However, we’ve recently witnessed state politics becoming increasingly concerned with technology in cases such as the Snowden revelations, the FBI-Apple conflict, and the private email server. The Choice is Yours proposes that this may have always been the case. In Learning Machine #1: Values, (2016), questions from the Myers & Briggs Type Indicator have been adapted to represent 300 values on a large AVM voting machine from 1945. After closing the red velvet curtains, the visitor is asked to complete the voting process—the results of which are projected on a large monitor outside of the booth. After about ten minutes voting, I watched as the monitor displayed an abstract collage of what appeared to be randomly selected Flickr photos of trucks, tourists, and landscapes collaged with Justin Timberlake lyrics and text from diaristic Tumblr posts, all run through heavy photoshop filters and assigned to move into, out of, and around the monitor’s frame. I struggled to identify any materialization of the voting process. Had my vote mattered? It was difficult to tell. AVMC’s promotional film reassured that these machines were void of error, mocking the previous technologies and stating, “The count is mechanically accurate…untouched by other human hands or minds—and that’s a long step up from tyranny.”1 However, the AVM wasn’t the final solution. Indeed, skepticism of the security of voting systems still exists amongst some Americans. Notably, Donald Trump has expressed fear that voter fraud will be the cause of his loss in the November election. Some citizens still struggle to understand if and how their vote matters at all. Insecurities of the democratic process are still prevalent, and on Tuesday, November 8th, I’ll likely leave the voting booth to watch a monitor that closely resembles the ones displayed in bitforms gallery, searching once again through a collage of newscasters, charts, and headlines for evidence of my vote. R. Luke Dubois, b. 1975, New Jersey is a multidisciplinary artist whose practice spans visual art, computer programming, musical composition and performance, and record producing. See The Choice Is Yours at bitforms gallery October 26 – December 23, 2016.